This tool works where no other tool can. It smooths the edges of fine slots, follows compound curves and contours and works into corners of tight interior angles. Ideal for removing flash or glue seams from plastic and metal castings and for smoothing turnings while still in the lathe. Tough, Mylar backed abrasive ribbon with end loops slips easily and quickly over the anodized aluminum frame. The spring action of the frame maintains a constant working tension for delicate control with hairline accuracy. 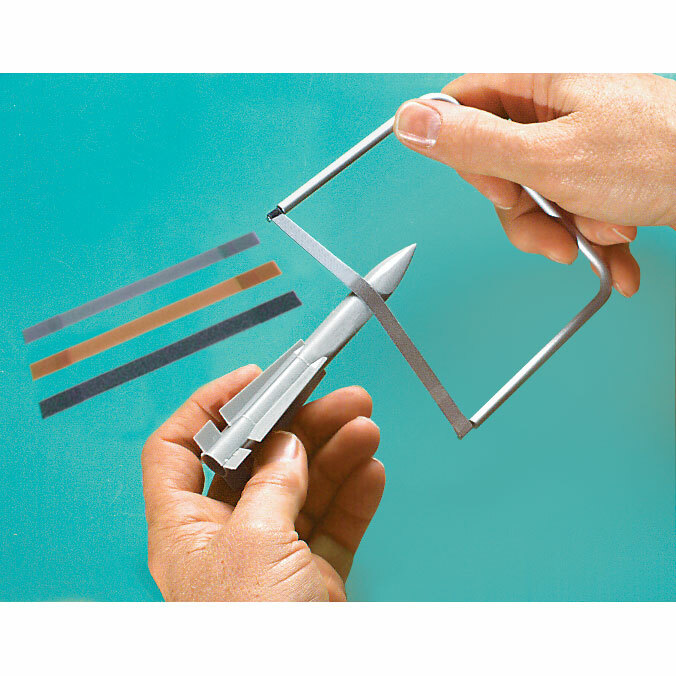 For fine finishing of models, dollhouse miniatures and other small-scale projects, this unique tool cannot be beat. Frames are 4 inches x 4-1/4 inches. Abrasive ribbons are 1/4 inch wide x 4-1/4 inches long. Set includes 3 frames and 16 assorted color coded ribbons. Quality tool that works as advertised. This is a quality little tool that is indispensable for some sanding jobs. It's easy and comfortable to use, and works very well.